It is often said, "How does one know where they are going, if they don't know where they currently are?" Also it is said "If one doesn't have a goal (budget), how do they know if they are where they are suppose to be?" Budgeting either for a business or for personal finances addresses these issues. It is where you want it to be? If so, can it be better? If not, where is it that you do want to be? And, how do you get there? Budgeting can help answer these questions. The first step in budgeting is to understand where you are currently. For a business, having the prior twelve months of monthly Income Statements will act as a great foundation. This creates the "where you have been" and the "where you currently are" aspects of the process. Budgeting is simply setting financial goals and building a plan to achieve those goals. Building a budget also allows for the anticipation of obstacles that may hinder the process of obtaining the set budgeted goals. Is a continual reminder of where you where, where you are currently, and where it is you want to be. Said another way, the budget is a measure of accomplishment. A budget is a call to action through a well thought out plan to achieve a specific financial goal, by identifying the step by step actions needed to accomplish the goal. A written reminder of your commitment to the end results. A budget identifies the benefit of the anticipated effort being invested on your behalf. The thought by those not familiar with the budgeting process is often considered to be overwhelming. The objection is that there are too many pieces and parts to contend with. The key to successful budgeting is to break the process down to manageable component parts and deal with them on an individual basis. This approach allows the preparer to stay focused on a specific area until completed. Once all the component parts are completed the combination will form the budget. 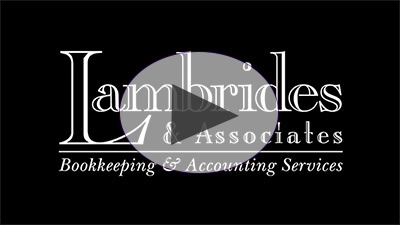 Here at Lambrides & Associates we work with our clients to eliminate the feeling of being overwhelmed by the process and to utilize the budgeting tool to its maximum capacity. With the combination of the clients input as the experts in their business, and our knowledge of the budgeting process along with models proven over time, we are able to produce a financial "road map" for an upcoming period. This is done through a series of "What if" questions built to be a tool for not just the time frame in question, but can be updated/modified for future periods as well. For more information on budgeting, contact us. "Where did the Money Go Report"
"The team at Lambrides and Associates is a strategic partner to my business. As a client, I count on L&A to track my assets and liabilities so I can concentrate on growing my business. I highly recommend any business owner to see how L&A can help them achieve their business goals." "Responsive, accurate, detailed, and committed to producing a quality product. Those are the words that best describe George Lambrides and his team."